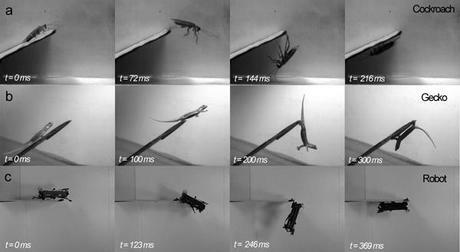 Locomoting animals show remarkable diversity and capability. From the ease at which a gibbon can swing through the trees, to the profound efficiency of the hops of a kangaroo. Some of the more perplexing and intriguing modes of movement are documented in our more miniature companions to whom the smallest crevice can seem a gargantuan ravine. Life in the undergrowth often means negotiating relative Grand Canyons repeatedly, and it appears that both the cockroach and the gecko have an innovative solution for survival. To the naked eye, when pursued along an incline towards an edge with no escape, both geckos and cockroaches miraculously and seamlessly continue to run over the edge and back down the incline on the underside. The manoeuvre was baffling to the team at the University of California, however when filmed at high speed and viewed at a reduced frame rate all was revealed. Both animals ran flat out, and with no reduction in speed leapt from their ‘cliff edge’ only to grasp with their hind legs producing a pendulum like inversion allowing a completely continuous, albeit upside-down run onwards. This wonderful analysis inspired Biologists and Engineers to put their heads together dissecting the movement in a way that was computational to robotics, and a small mechanical mimic was born. The hexapedal robot named DASH can execute the inversion relying on velcro hind hooks, and can navigate much more complex terrain than previous types of rover. The team have a long way to go in terms of replicating the efficiency at which this type of locomotion is carried out by their little legged inspirations, however the continued quest has extremely important prospects stretching from the afore mentioned rescue rovers through to more stable and intuitive artificial limbs and wheelchairs. Studies like this highlight that many of our most perplexing questions can already be answered by Mother Nature, it is simply a case of asking her! She Sells Sea Lego on the Sea Shore!